There is one group of plants, which supports the largest masses of wildlife in the world and also supports most of our human populations: grasses. This remarkable plant group covers a fourth of all the land on the earth. 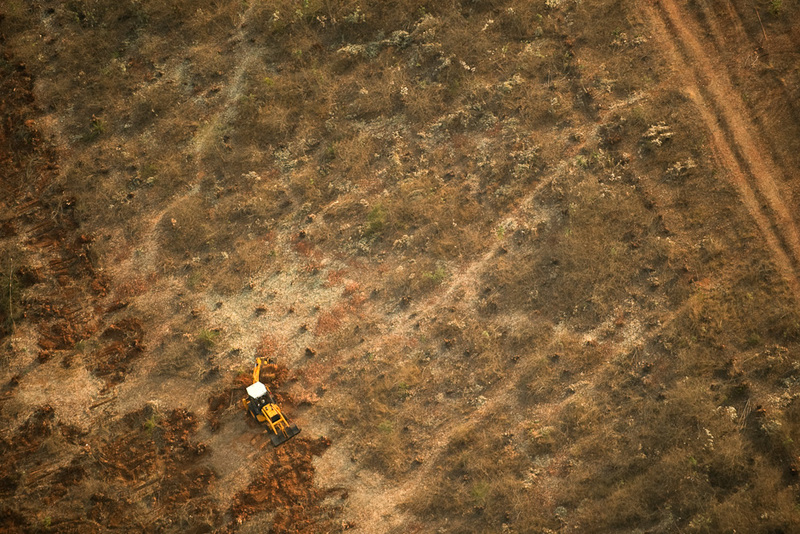 Grasslands flourish where there is just enough rain, but not enough to support forests. Almost 70% of our daily diet is derived from grasses. Rice, wheat, maize, barley, are all species of grass which have been cultivated since the advent of agriculture and selectively bred over the last 10000 years by humans. Bamboo, also a species of grass is a very important resource for both domestic and industrial purposes. Today, grasslands are under assault. They are among the most endangered natural habitats on earth and India is just about holding on to the last remnants. I had the opportunity to visit and work in these amazing landscapes in the past year and through this photo essay I share my experiences and thoughts. India has different types of grasslands. There are the terai grasslands along the Ganga and Brahmaputra floodplains which hosts the highest large mammal concentrations in the country, comparable to the savannah in plains of Africa. The terai grasslands, dominated by the elephant grass spreads along the foothills of the Himalaya. 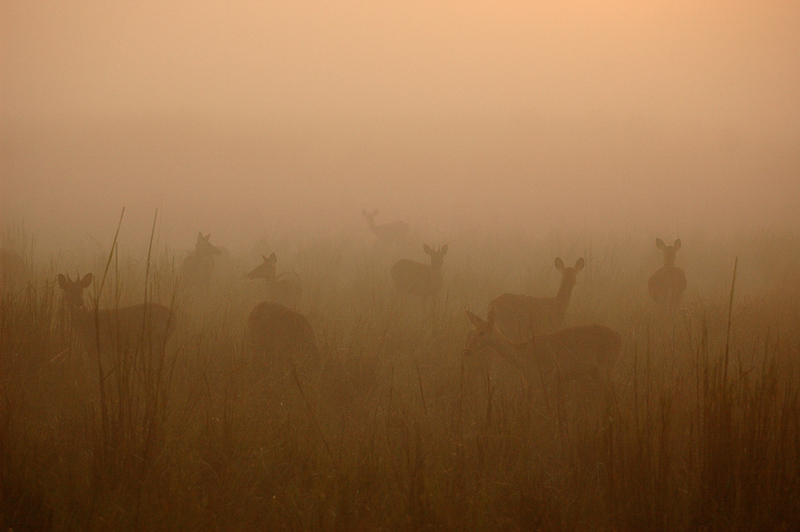 Here is a herd of Swamp deer Rucervus duvaucelii in Kaziranga National Park. This region also supports the highest human densities and is the most productive agricultural belt in the country. One also comes across patches of grasslands within the forests of central India. These are meadows where once were human habitations or villages. 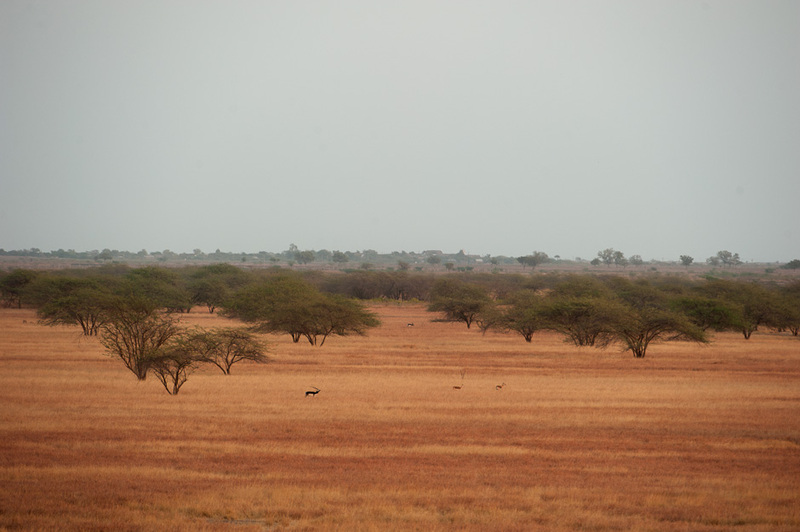 Once these were abandoned or the villages translocated, these villages transformed into grass meadows to host a rich variety of mammals and predators too. 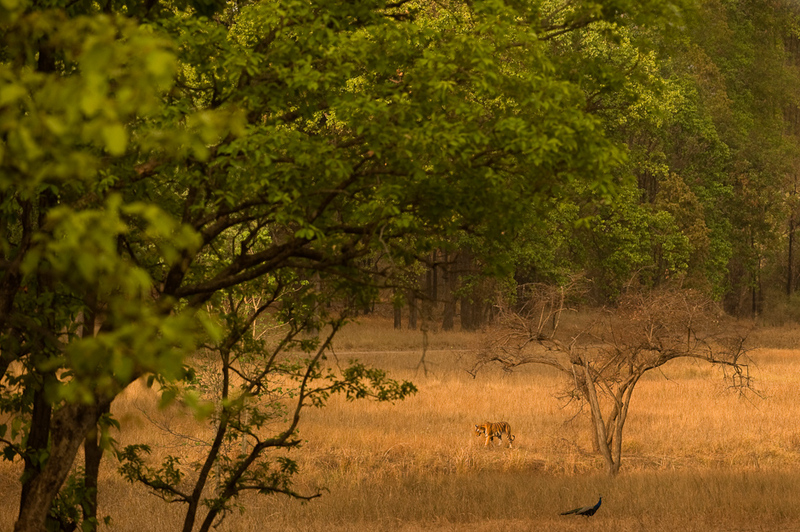 Some of the best tiger habitats in the country are these meadows in the wooded forests. 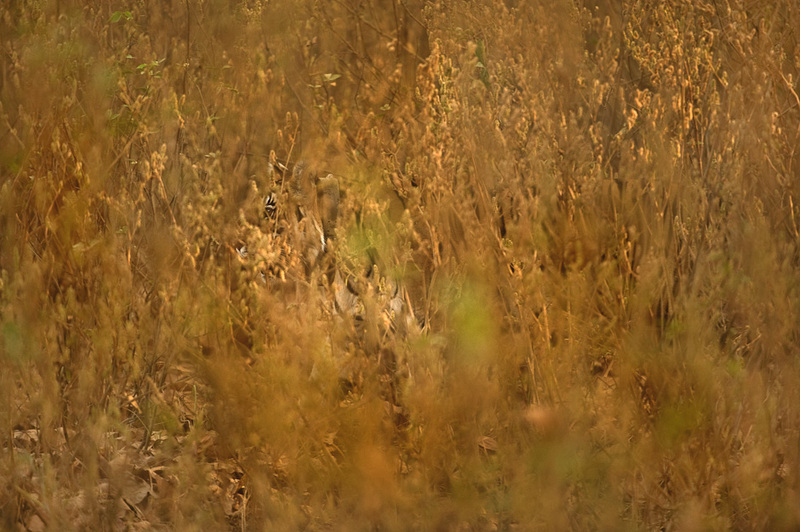 Here a tiger uses the dry grass as a perfect camouflage and stalk its prey in the grasslands of Kanha National Park in central India. 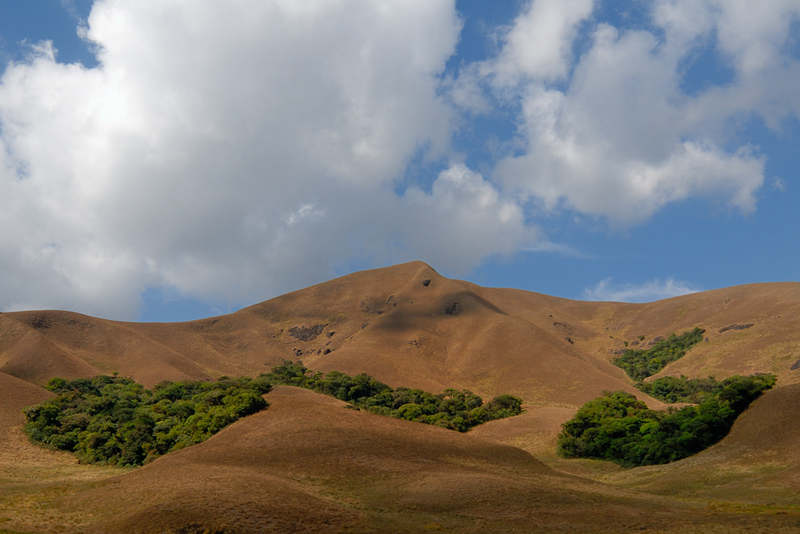 Another type of grassland is the high altitude shola-grassland which is found in the higher elevations of the Western Ghats. The shola patches have a high diversity of species including many endemic forms, but the grasslands although relatively low in animal diversity, have some species such as the Nilgiri Tahr specialised to this habitat. 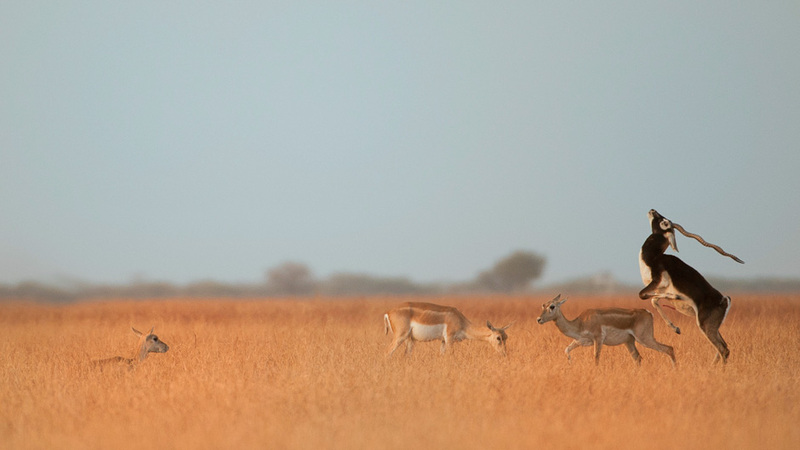 The most endangered of all our grasslands are the dry grasslands, found in the arid regions of India. 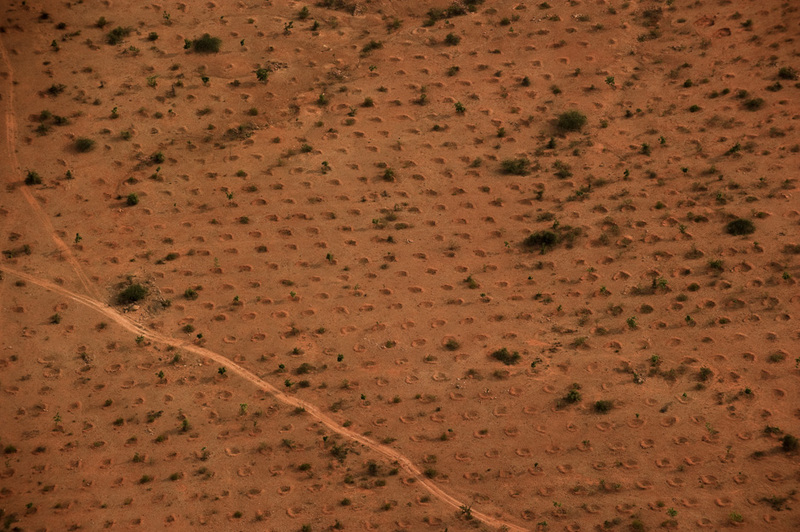 Here the annual rainfall is too sparse to support forests but not dry enough for it to be a desert. A handful of these habitats are marked as protected areas in India, while most of it lie outside these protected areas usually marked as 'wasteland' by the revenue departments. 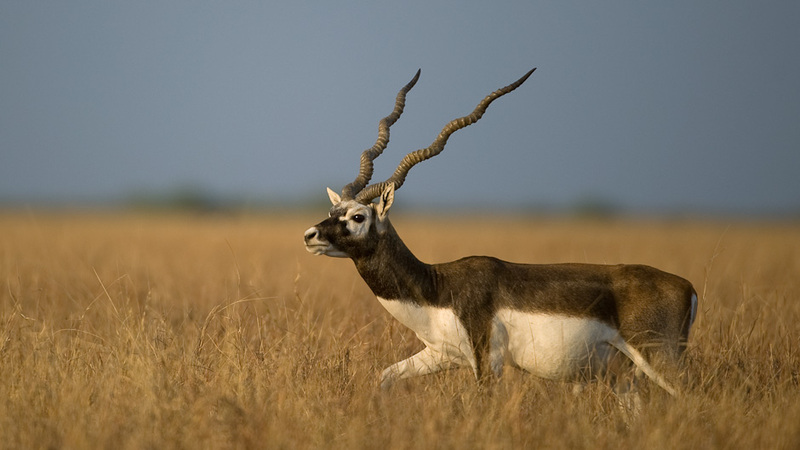 These grasslands are home to the Blackbuck Antilope cervicapra which is the flagship of this habitat. They are native to the Indian subcontinent and are found in a wide range of habitats from arid grasslands and scrublands to marshy coastal plains. This species exhibits a high degree of sexual dimorphism; the male is larger than the female, is strikingly coloured in black and white, and sports a magnificent pair of spiraling horns. 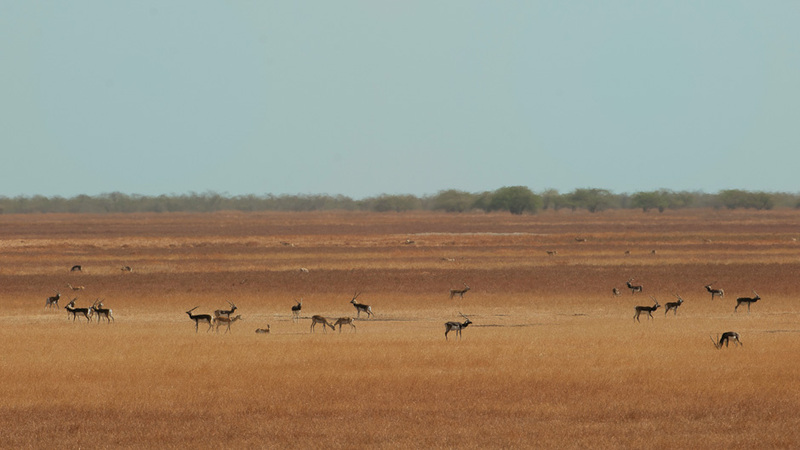 The coloration of female blackbucks are different. The females are light in colour and lack the horns. Even the young males (one on the far left) are coloured light brown and sport short horns. As they mature, their colour transforms to black and the horns grow. 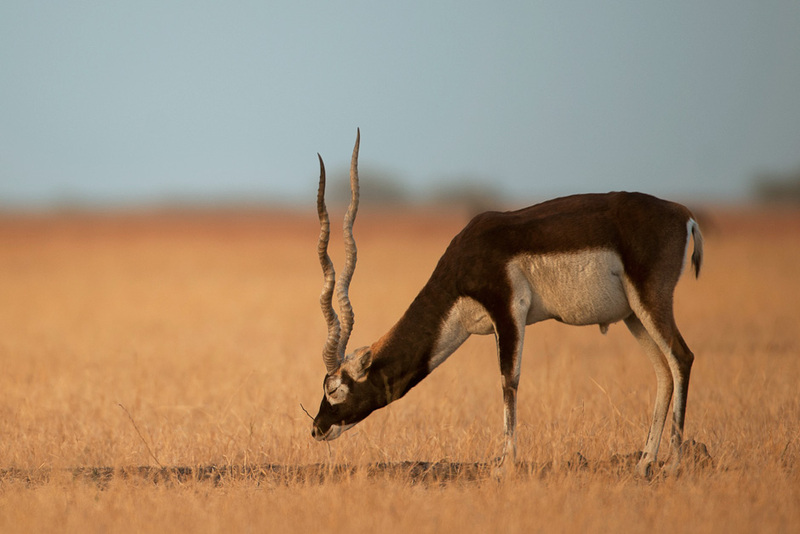 Like most other antelopes, these blackbuck, defecate in the same area everyday to mark their territories. Sometimes these dung piles become large and the males keep coming back to check on them and also rub its smell on themselves (to attract the females). During the breeding season, especially in these grasslands, many adult males congregate in the choicest part and exhibit a behavior called lekking, akin to the swayamvara in hindu mythology. It is an unusual mating system in which males come to an open area, defend territories, and are sought out by females for the sole purpose of mating. In this aerial photograph, the 'worn out' patch of the grassland is the lek, the dark patches dung piles of each of the male blackbuck. 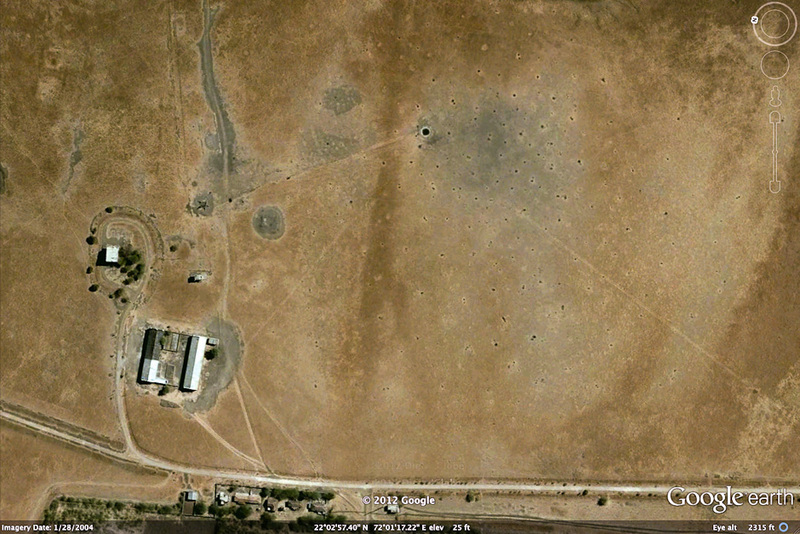 This lek site is obvious even from space. Here is the google earth screen shot of the lek site in Velavadar National Park. 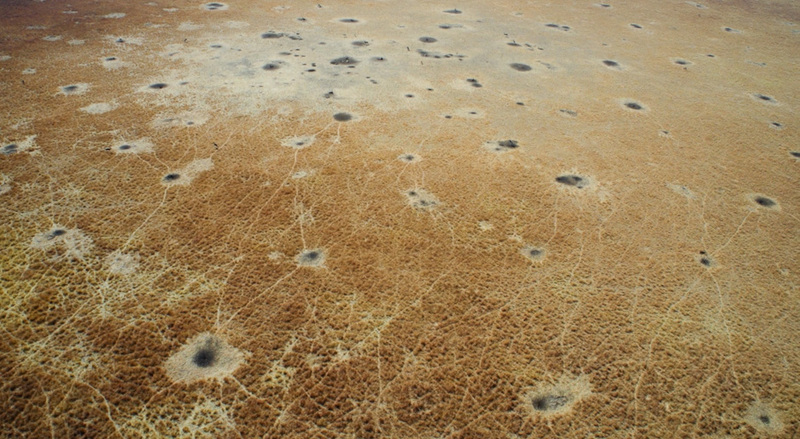 The bigger circles are water holes and the black dots are individual lek sites. The middle of this crowded lek is the most prized possession for the males as all the females would like to mate with the males who are in the center as they probably are the best since they have to fight day and night the males challenging him/them from all directions. So for a few weeks, till the time females turn up at the lek, the males fight it out for the central position. Young males are not tolerated by the older, mature males and any trespassing by the younger males are immediately dealt with. All the males join to chase away the young males and then they get back to their own fighting. Young males, do not stand a chance with these males, yet they play around here to test the waters. Eventually the climax happens on the lek. The females walk into the lek and sit on the dung pile of the male they choose, which are usually the males towards the center of the lek. As you can see in this photo, even the females spar and nudge fighting over a male of common choice. This is a very unique behaviour in the animal kingdom, where usually only the males fight for the females. The male who has defended his lek all season from all other males, finally gets to mate with his females, who have all chosen him over other males. 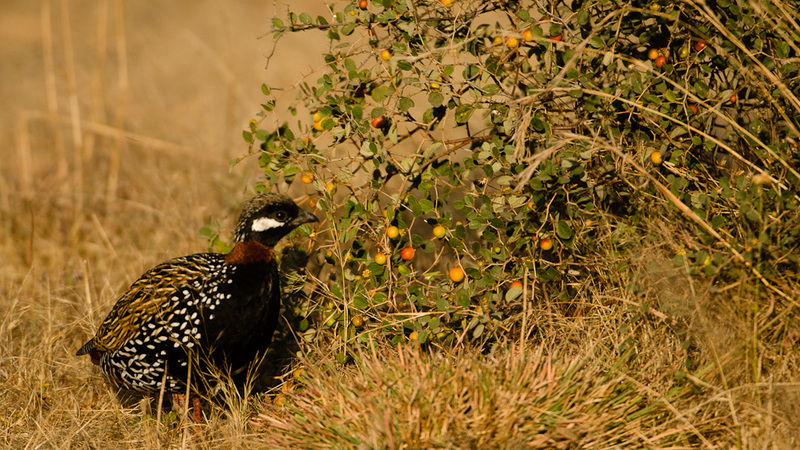 One of the less known and colorful birds is the Black francolin Francolinus francolinus, seen here feeding on Zizyphus fruits in the grasslands. There is one species which makes it home exclusively to these grasslands. 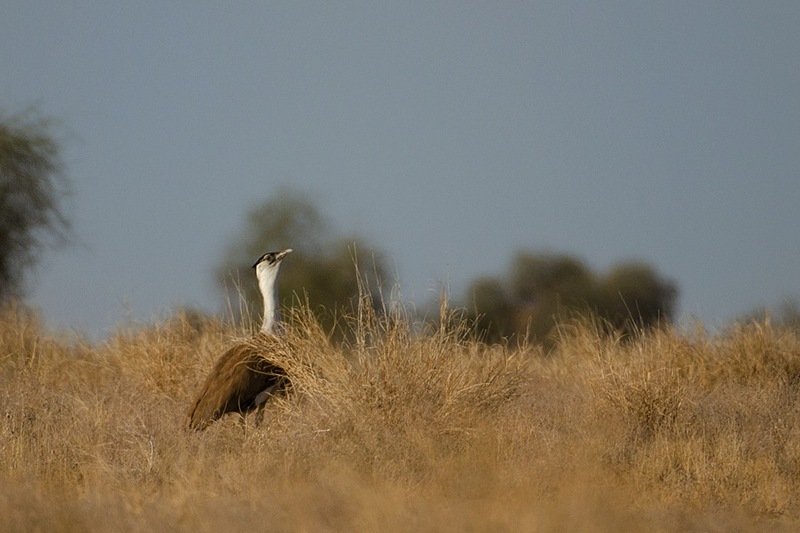 It is the the critically endangered Great Indian Bustard Ardeotis nigriceps and today as few as 250 of them remain in the wild. They are one of the largest flying birds in the world and they are found in just few pockets of grasslands in India. 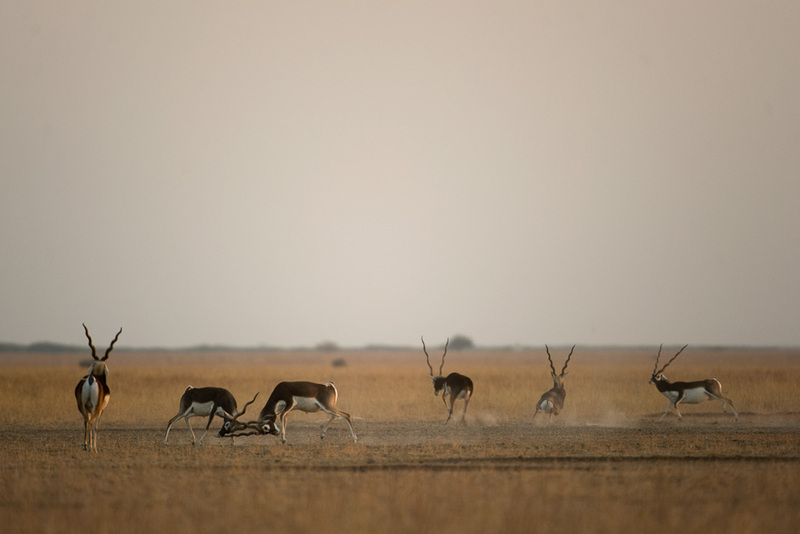 In the last 50 years, because of the loss of grasslands, they populations have plummeted by 90% . 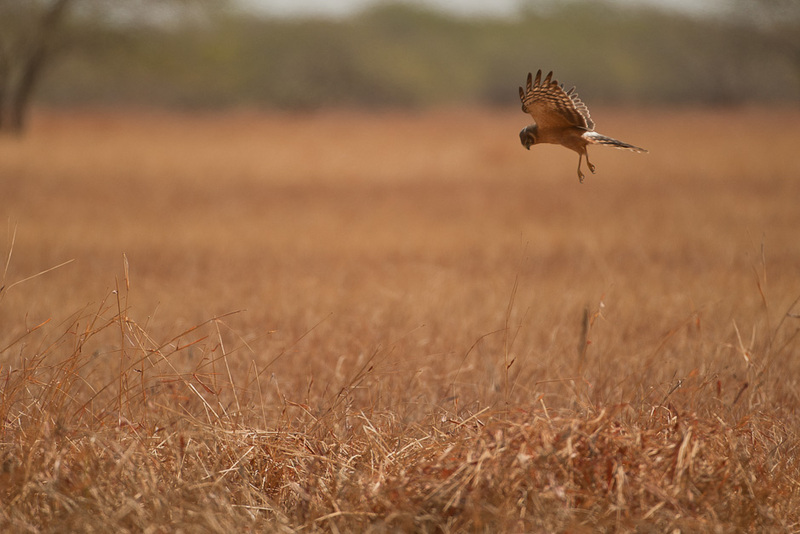 Thousands of harriers migrate to India in winter and they stay and roost in open areas like the grasslands. In some places like Velavadar National Park, one can see hundreds of harriers roosting in the grasslands. The grasslands give cover to a wide range of rodents and small birds. These in turn attract an amazing array of predators like the Jungle Cat Felis chaus which thrive in these habitats. 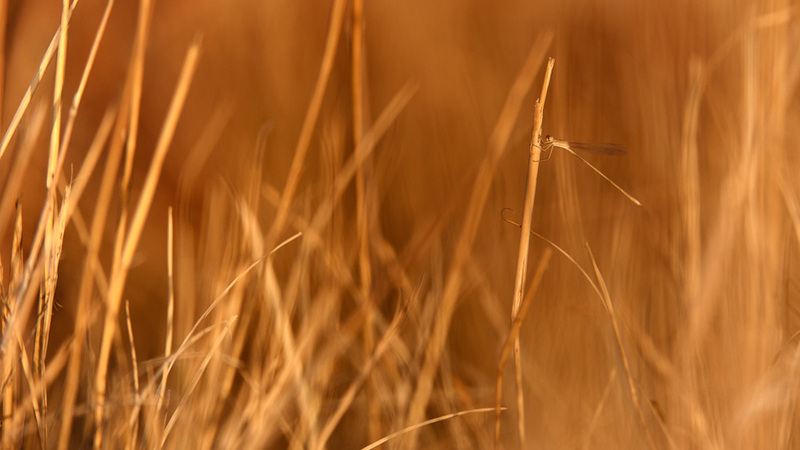 A damselfly (Copera sp.) alights on a blade of grass. 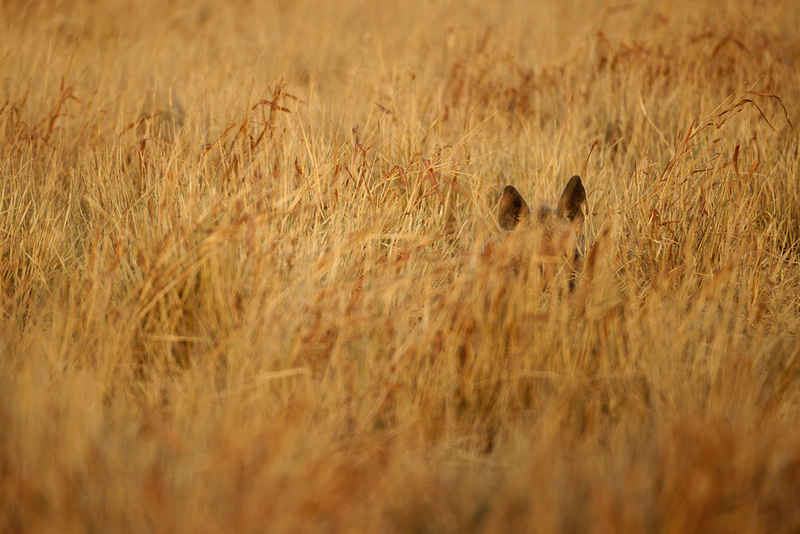 It pays to be well camouflaged in the grasslands as its a very open and exposed. Grasslands support some of the lesser known predators as well. 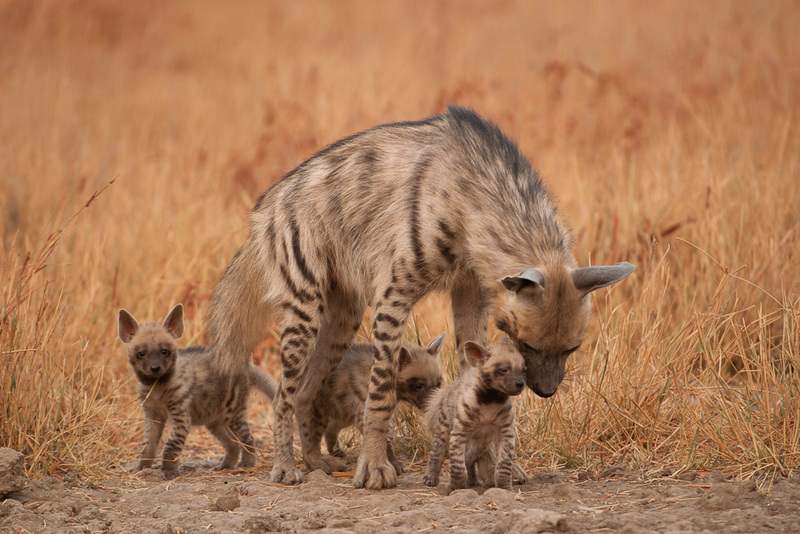 Hyenas, with their bone-crushing jaws, are powerful scavengers who are always looking out for the dead and decaying in these hostile landscapes. 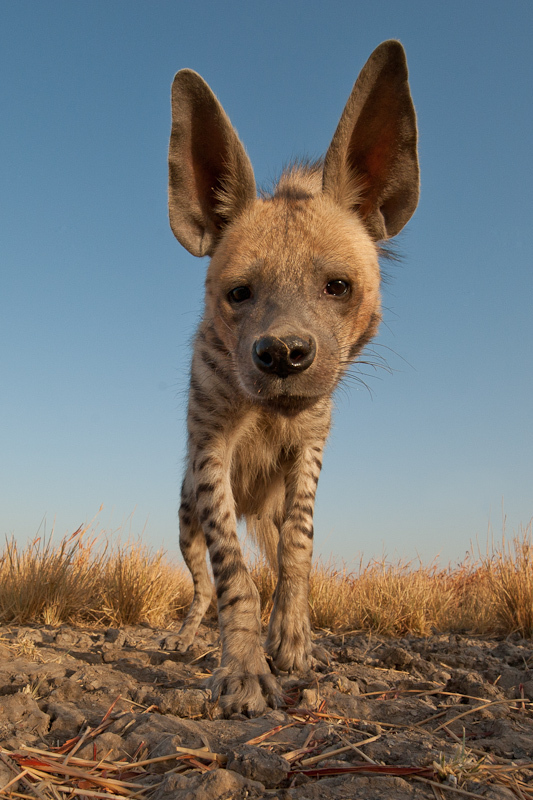 This Hyena had walked away with my camera trap last year, and I was fortunate to see the same individual this year and managed to finally get a shot of this one with a remote camera trap. The grasslands are the most exploited landscapes in India. Except for few pockets of grasslands that are given the protected area status, most of these places are marked as wasteland and are owned by the revenue departments. People in and around these areas depend on these grasslands for grazing and fuel needs. Even though it has an impact, it is very marginal compared to the landuse changes in and around these areas due to large developmental and industrial-scale projects. Because of being labelled as waste lands, our government departments including the forest department, want to manage these habitats to make them look 'green' and have trees to attract birds. When JCBs move into a natural habitat, one knows thats the beginning of the end. In many places across India, even close to home (Hessarghatta, Bangalore), the government has been using JCBs to dig these pits to plant the alien (Australian species) Acacia and Eucalyptus species. Dry thorn-scrub and grassland habitats without trees are natural too. However, the government does not realise that open habitats like these are critical wildlife areas and not waste land. Any and all trees that are planted dont make forests, and all natural habitats need not have tree cover in order to support wildlife. 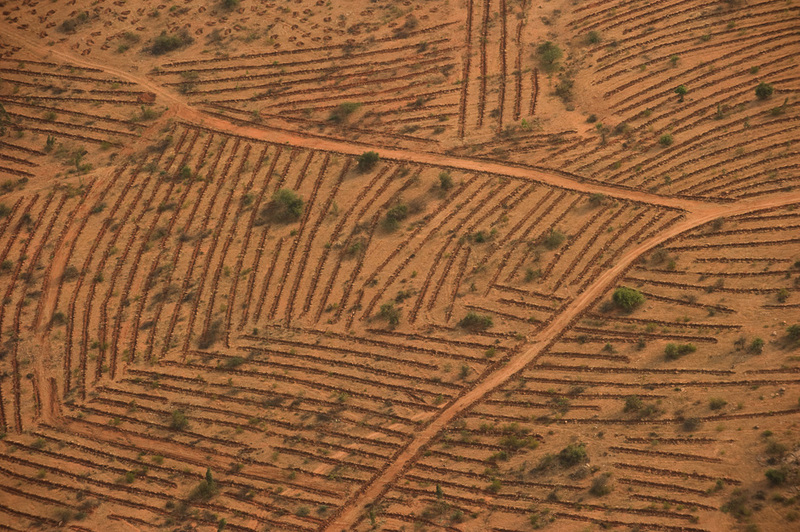 The Earth scraped out in neat rows for planting. This disturbs the top soil which contains critical seed banks, nutrients, and their much evolved role in natural cycles. 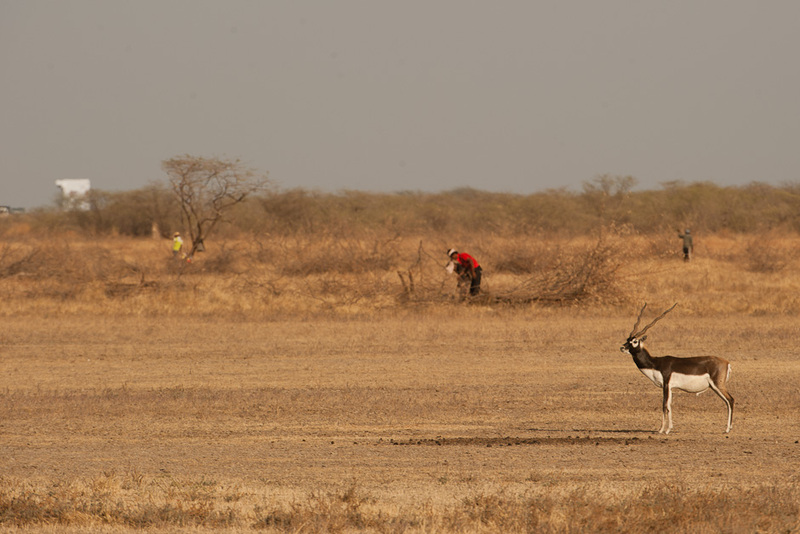 Often grasslands are planted over with alien species such as this Acacia either as social forestry or compensatory afforestation measures. 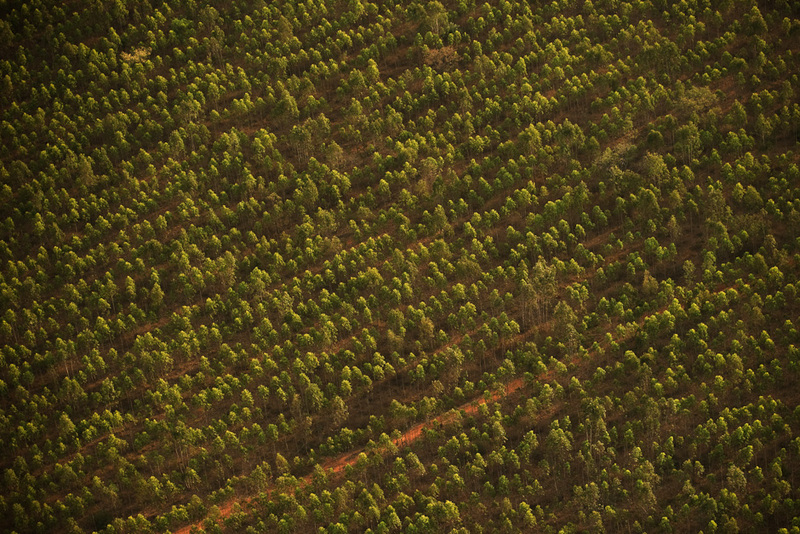 Although this plantation looks like a dense forest from above, in reality does not support wildlife, affects the soil, natural regeneration, and the ground water table, particularly in arid areas such as these. Even worse are the so called 'Green Projects' which sometimes do more damage than good. When a lot of money flows into green projects, grasslands are the first ones to be diverted under these schemes (or scams?). 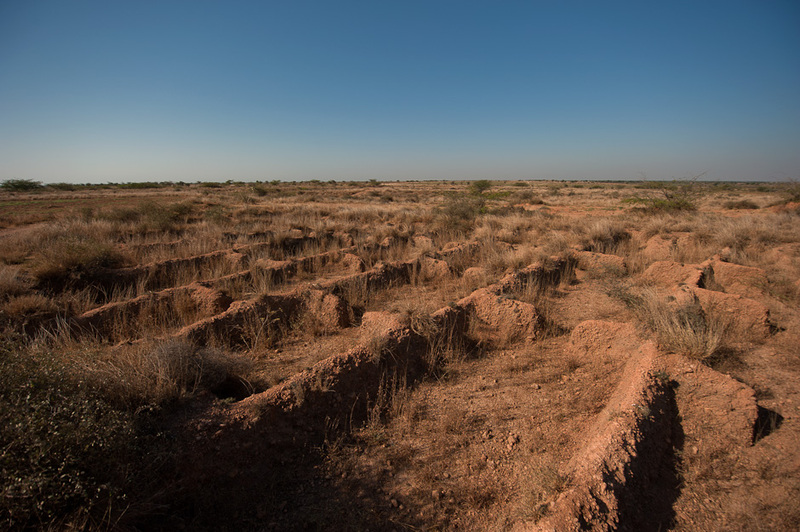 Here, large unnecessary pits are dug out in the grasslands in the name of 'rainwater harvesting' and to use the 'rozgar yojana' funds. What rainwater? 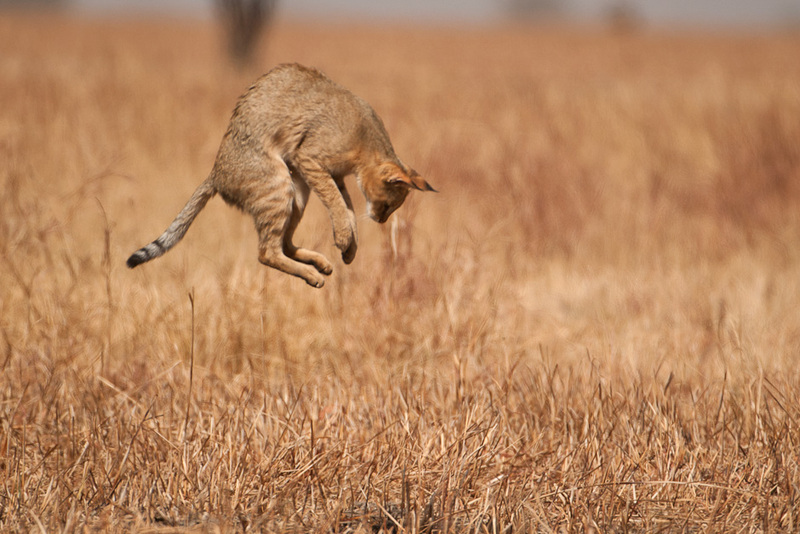 What harvesting in a natural habitat that too in an arid zone? Particularly in grasslands, where the grasses do just this. Solar panels are setup at the edge and around the grassland national parks. 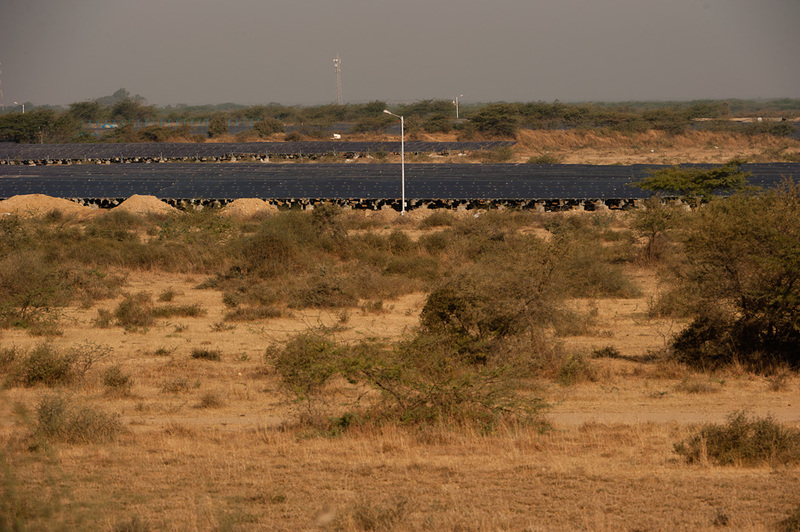 This one by Adhani group are being projected under the 'Gujarat Shining' projects, but in effect they are taking up precious grasslands in the name of clean energy which the government gives huge subsidies. Solar panels are good if they are not done at the cost of natural habitat. About 80% of India's population depends on direct derivatives of grass species. 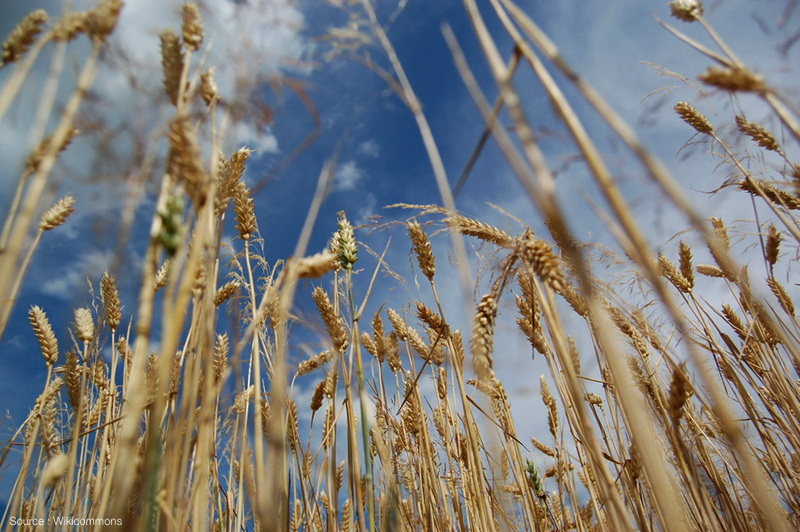 Grains like wheat, rice, corn are all species of grasses which have been domesticated. They form our staple diet and are critical for nutritional needs of the country. Grasslands and open forests deserve a lot more respect than they get today. 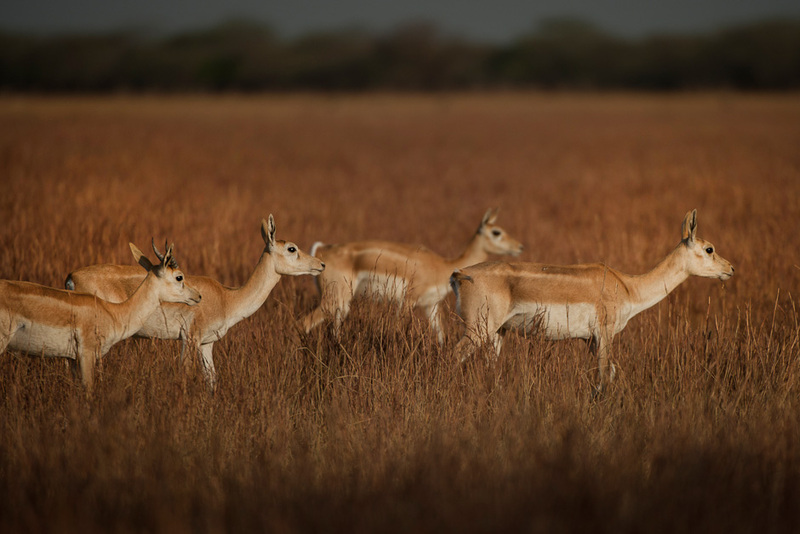 Across India, there is an urgent need to protect grasslands. There are major grasslands around some of our big cities as well and they need all the support they can get to be preserved. Show your support to places like Hessarghatta and Maidanhalli around Bangalore, Nannaj near Pune , Neliya and Banni grasslands in Gujarat, Rollapadu in Andhra Pradesh. Say no for grasslands being handed over for other land uses. For example, an amusement park is coming up in Hessarghatta. Say no to forestry projects which mindlessly plant alien species. We must realise that one forest does not replace another. When you see this happen, write to the forest department and the government, voicing your concerns. Say no to green projects like solar and rainwater harvesting by the government when they divert natural habitats to do this. Alternatre areas must be used as well placed solar projects can be a great source of energy for our country. Raise your voices, create awareness and join campaigining citizen groups against mining, quarrying and other development projects in these threathened ecosystems. 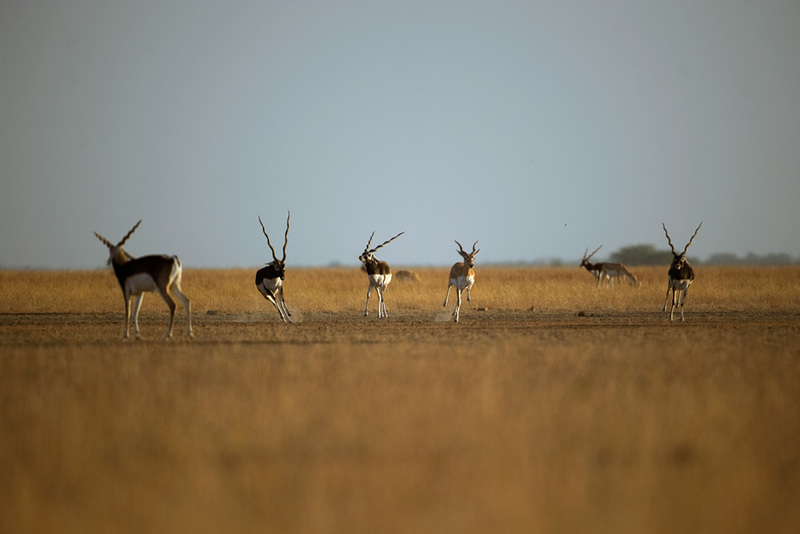 While the remnant grasslands are still graced by the shadows of blackbucks and bustards, the dark shadows of changes and development loom large and threaten their very existence.